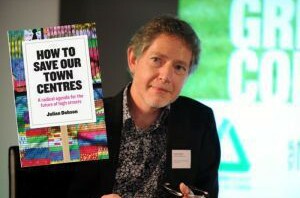 Julian Dobson is a writer and researcher, as well as one of the co-founders of New Start magazine. His area of special interest is community regeneration and how to create better places. We loved his recent book ‘How to Save Town Centres’ so much that we gave it a glowing review, and thought we’d chat to him too. So we did. What’s wrong with our high streets today? Why did you feel you needed to write a book about what we can do about them? I’m interested in what creates good places. If you want to get a feel for how a place is working, visiting the high street, the town centre, gives you a very good idea. It doesn’t tell you everything, but it unlocks a range of issues about how the town, how the place is working. I’ve been interested in this for quite a long time. Back in 2011 when David Cameron asked Mary Portas to do her review of the high streets I got a bunch of people together to put in a submission to that review. That bunch of people included quite a range of interests, people like Pam Warhurst from Incredible Edible, a guy called Dan Thomson who runs something called Artists and Makers and was previously running something called the Empty Shops Network and was looking at new uses for empty shops. People who are interested in looking at new angles of how to use space within town and city centres. What are the issues we were trying to highlight? Firstly, the conception of the high street purely as a retail space. The colonisation of town centres entirely by shopping has actually stripped away some of the public realm, a lot of the civic society that used to be central to town centres and so what we were talking about really was a rebalancing of the activities that go on in town centres so that you’ve actually got something for everyone, so that you protect the activities and the buildings and the spaces where people can do things other than shopping. To start to think of what creates space in a much wider context than purely this retail approach which is very much driven not only by the retail industry but by the property industry, and is premised on making quick capital gains from the building and the selling off of retail premises. What we were trying to do was challenge that approach and say that actually there’s a whole lot of other things that have community value that need to be in high streets. You wrote that “the flatulent promise of retail-led development is a powerful one” and it entices planners and governments, it’s very attractive to them. What’s the best way to challenge that myth that all you need is a glittering shopping centre and everything will be ok? Part of it is history. It hasn’t always been this way. In terms of looking at how things could be different, first of all you have to remind people that things have been different. They haven’t always been like this. Secondly, you have to start thinking about what that actually creates in the local economy, the idea that the economy is created through retail is nonsense. What retail does is it scoops off people’s disposable income. That’s great, we all need to buy stuff. We all need to go to places where there are nice things to buy, so I’m not knocking shopping, I’m not saying let’s get rid of all the shops. But the shopping is not the economy. The shopping is what happens if the economy is successful. Liverpool One: “the flatulent promise of retail-led development”. So how can town centres once again be places which are at the heart of a local economy where people have a sense of ownership of their space, where people have a sense of civic responsibility within their space; so that the goods that are being produced in a place can be sold in that place, so you’ve got that localisation that you talk about a lot with the Totnes Local Economic Blueprints? And where you’ve got a sense of pride that comes from people actually working to build and to create spaces that are good for people. Shopping is the icing on the cake. But you’ve got to have the cake. You’ve got to have the activity that makes a place function well, and you’ve got to have the activity that makes a place function well for everyone, not just for the people who are well off. You wrote “real hope involves getting your hands dirty.” What did you mean by that? I mean that we need to have experimentation and we need to have people who are prepared to get stuck in in whatever way they can do, and whatever way they have the ability and the talents and the context to do. One of the examples I use is Incredible Edible Todmorden. Incredible Edible is literally people getting their hands dirty. Planting fruit and veg in public places, which actually creates a sense of the possibility of the place being different. Not just by saying “here is food to share”, which challenges the idea that the success of the place is all about buying and selling, but actually physically changes the space in the town. It actually changes the look, it changes the feel of the place. 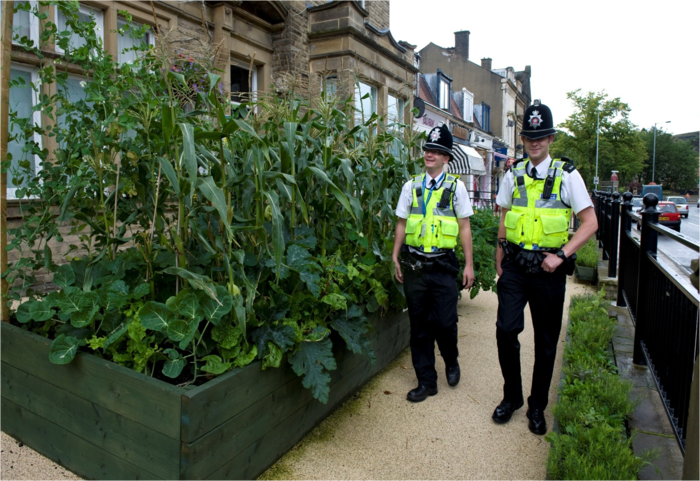 Food growing outside the police station in Todmorden. Photo: Locality. Obviously, people have different skills and abilities, so not everyone can get out and plant free vegetables. Not everyone can do street art. Not everyone can do things in empty shops. But we can all do things that help to make these experiments happen. A lot of that comes down to self-confidence. To feeling like if you change things, things are going to change. Somewhere like Todmorden seems to have that, and somewhere like Totnes, which appears a lot in the book, and Brixton. Places that don’t have that, did you come across examples where that happened or is it more inevitable to be more top-down in places like that? It’s more difficult, more challenging … and that’s not surprising. But if you look at where change has happened in the past, one of the places that I went to in researching my book was Rochdale. Now Rochdale was the home of the Co-operative movement, and the Rochdale pioneers, the first Co-operative Society in Rochdale was created by a small bunch of people saving up small amounts of money over a sustained period of time in order to do something that was completely ridiculed when it started. The creation of the first Co-operative shop was laughed out of court. It’s a question of patience and time. In the more difficult places, it takes longer and it obviously helps if you have governance, central or local, but affirmative and that puts its investment to match the investment of local people. 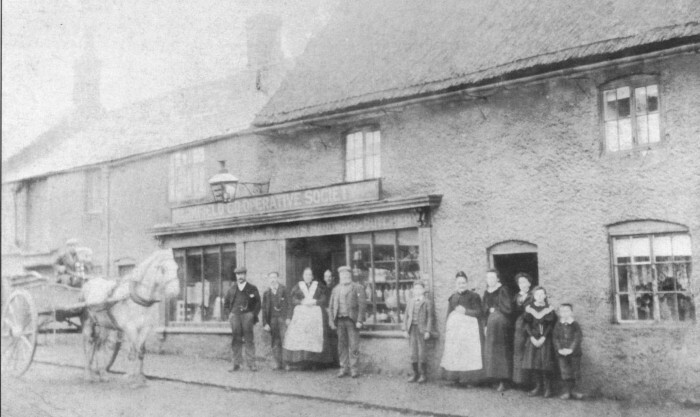 The first Co-operative shop, Rochdale. Where we see things going wrong is where you only have investment by government and official bodies. So you look at the regeneration programmes that took place in lots of places in the 1990s and early 2000s and you’ve got big amounts of money relatively speaking coming in, but the legacy is actually quite limited because once the funding stops, the activity stops. So you need to find ways of using the funding that’s available to enhance local activity and to invest not just in places but in people, and the people who are going to invest their lives in those places and stick around in the long term. You wrote “ it’s time to raise a glass to the New Economy because it’s the best hope for our high streets.”. What is the New Economy for you, and what does it look like? It’s very much a blanket phrase that covers a multitude of things. Trying to nail down the New Economy specifically is a problem, we do need to keep it open. But what I think are the characteristics of what I call the New Economy are: first of all rethinking production and consumption. The illustration I gave in the book was of the growth over the last few years of small breweries. It’s not just because I like beer, but actually if you look at the brewing industry, the way that the big brewers in many places were closed down and small ones, craft breweries owned by local people and creating local character, that’s really important, to see how that reconnection of product and place is happening. So that’s the first thing that I think is important, that it’s much more peer-to-peer. It involves a lot more sharing of knowledge, of space, of collaboration. A lot less emphasis on commercialisation. The third thing that’s really important is that it has a social purpose often, as well as a commercial purpose. So that sense that the values that are being created and being exploited through business are not just the values of financial gain but the values of creating good places, creating great products and creating a sense of community and society. You’ll find a lot of people, a lot of entrepreneurs, whether they’re entrepreneurs in traditional business or in social enterprise which is not for profit, who actually have that sense of civic and social value as well as the sense of running a good business. 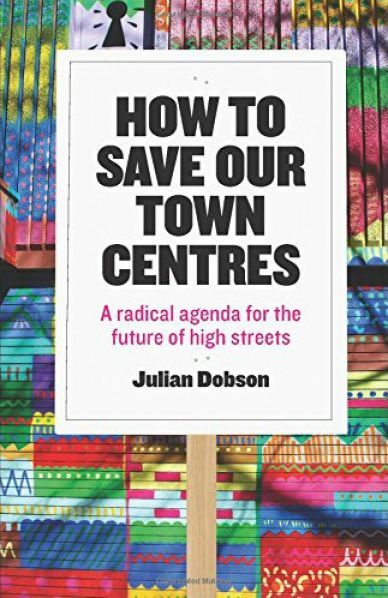 It’s time to actually bring those business values to the fore, to say loud and clear to the people who see our town centres purely in terms of big development, big brand retailers, that actually there are different ways of doing business. I’m not anti-business. I’m for different kinds of business and different ways of doing business, and business that actually works for the people. Not business that is about extracting value from places and appropriating it into the pockets of the few. How far would you say are we away from the ideas in your book becoming a much more mainstream way of looking at local economies? It’s really difficult to tell. I tend to be cautious in that I’ve been around for long enough to see lots of people who say such and such is the next big thing, then it withers. We are actually working in a very hostile climate – I don’t think we should underestimate that. However, there is a genuine sense in many places that it is time for a change in what we value. That’s the really crucial thing, that’s what underpins all these experiments. What’s happening in Preston (subject of a future blog) is about saying there are different ways of valuing what we do in the city. It’s not just about big development, it’s not just about big new shopping centres, it’s not about the traditional inward investment when you expect some big new employer to solve all your problems. It is about recreating the networks and structures that enable civic life to flourish and I think there is a real appetite for that. There are still, in many places, the resources to enable that to happen. What we need to see is people stepping up to the plate who are not just within local authorities and the public sector, not just within the voluntary sector, but actually the private individuals who are prepared to say “I’m going to put some of my own wealth, my own assets into this because we want to see places that are good for our children and our grandchildren”. If you look back to the municipal growth of Victorian cities, you’ll find that there’s a huge amount of reinvestment in places by people who are making money in those places. We’re not really seeing that in the same way at the moment, so we need to be able to say to the individuals who are property owners, who are making money from the places that we live in, to the businesses that are making money from the places that we live in “you’re got responsibility here as well. You should be working with us to reinvest in these places”. Reinvestment from the private sector is needed to match the new thinking that’s going on in communities and in the public sector and voluntary sector. A lot of communities up and down the country, rather than being able to focus on the great things they’d like to be able to do, end up rallying around trying to stop awful crap developments from going ahead. I wonder from the research you did for the book what you learnt about the best ways to resist development like that? What suggestions you might give to communities facing something like that? We need to start the reverse of that process where as concerned citizens we get together, particularly through organisations like Development Trusts, to identify what are the places that we need to keep for our local community and how can we get hold of them. How can we start to make sure that that property, those public places are managed for the benefit of the community? You really need to be as active at a community level to start doing that as the supermarkets are in scouting out land in order to really start to create change. But we’re a very, very long way away from that. There are a few examples of local organisations that have managed to start owning public assets or landmark buildings and turning them into places that are really useful and valuable for the community again. But we’re a long way from seeing that happen on a significant scale. How important is it that communities start to own and manage assets? It’s crucially important. It’s a difficult thing to do because it involves all sorts of skills and often the assets that are most of value to communities are ones that need a lot of investment and a lot of physical investment. But if you look at the pattern of property ownership around the country, you’ll see that increasingly places cannot be improved for local people because of who owns them. You have the same issue in Totnes with Costa. The people who wanted to sell to Costa were actually based in London. They had no particular interest in Totnes as a place at all. We see that being repeated across the country. Ownership is distant from a place and people who rent out and sell commercial property are doing it without any knowledge and without any concern for the future of those towns and cities. How do we turn that around? You have to do it by starting to put property in the hands of local people. One of the examples I used in the book is Letchworth Garden City which was place that was created to fulfil everything. People talk about garden cities all the time now in this sort of romanticised way, but the really crucial thing about Letchworth was actually property ownership. It wasn’t just that it was a very green space, it was that the property was owned for the benefit of the community. Even now you’ll find that the Letchworth Garden City Heritage Foundation runs the commercial property in the centre of the town in order to reinvest in Letchworth. 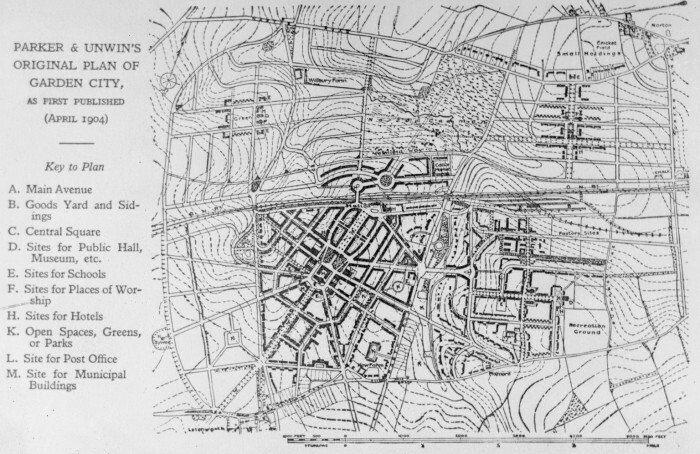 Original plan of Letchworth Garden City, 1904. How do you retrofit that kind of model to other towns? That’s more difficult but it’s not impossible. Part of that is finding the strategic places that need to be kept for the benefit of the public. So where are the places in our towns where you can start to take action? It might just be one property, but from that you might be able to expand. There’s an organisation in North Wales called Galeri Caernarfon which has started to buy up a number of properties around the town. After a while you can see how that patchwork might start to change the way the town looks and feels and start to change the economic flows within the space. But it will take time. Some of the best examples, places like Coin Street on the South Bank of the River Thames in London, places like Westway Development Trust in West London … they’ve taken 30-40 years to reach a point where they’re now successful and where they’re property owners to be reckoned with in their own right. So it is going to take time but it is important because otherwise whatever community organisations do within their towns is going to be vulnerable by somebody else coming in, buying up those assets, and then using them for purposes that are not beneficial to local people. You mentioned Totnes, which appears quite regularly in the book and Brixton as well. I wondered what it was that you saw in the places that were doing Transition that was particularly of interest to you? What the Transition movement does incredibly well is to bring together the long term challenge of climate change as an over-arching impetus for action with small action at a local level. Small-scale experiments which are practical, which resonate with local people, which look as if they’re doable, and that can engage people at a practical and meaningful level. A lot of the talk about climate change is quite disempowering in that it is all so big and so complicated and it looks so difficult to do anything about it. What the Transition movement actually does really well is connect up the big issues and the local issues and show you that change can happen at a local level. There is something in the middle that still needs to be explored, which is how to bring that Transition thinking into the spaces within cities and governments where decisions are being taken. That will start to turn the tide and so far there is still quite a lot of work to be done to impact on those institutions and to change the way that institutions behave. What the Transition movement is doing really well is acting as a forerunner in order to show what the possibilities are. We now need others to start taking up that thinking and that action at a wider scale. Blog first published on the Transition Network website in May 2015, written by Rob Hopkins.